The end of October is in sight – and that means the end of the Apple Day season. We’ve been to so many this year, and over such a long period, that they’re more of an Apple Daze than Apple Days. At Much Marcle’s Big Apple events, 2 weeks ago, I gave one of my mistletoe miscellany talks, after spending time wandering round local orchards, and sampling James Gregg’s cider. Not my best performance – as the digital projector remote stopped working, really b*gg**ing up my timing, but it seemed to go down fairly well nevertheless. Today I think it’s probably all over for the season, as we’ve just returned from the Apple Day at the Kingcombe Centre in Dorset, set in the midst of hundreds of acres of Dorset Wildlife Trust grassland reserve. A relaxed day, with Caroline and I just visiting – no duties today. The centre, run independently of the DWT reserve, is a field centre running a variety of courses, and serving fabulous food from local sources. For Apple Day we had just had to sample the apple and parsnip soup, apple ploughman’s lunches, apple cake, apple flapjacks, apple muffins – you get the idea. There was thick local ham served with the ploughmans – and whilst eating it we had appropriate views of Baldrick, an elderly large white boar in the kitchen garden. And I had a long chat later with his friend Peggy, a saddleback sow. I found she has a weakness for cider apples, and, as a result, is now my friend for life. 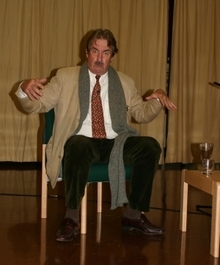 A mistletoey evening with John Challis – aka Boycie of Only Fools and Horses and the Green Green Grass. 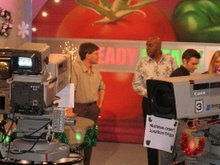 Though mistletoe was hardly mentioned, this was a fund-raiser for this year’s Mistletoe Festival – and John had come to Tenbury High School (for free) to entertain a paying audience with his reminiscences. It’s easy to forget what he did in the pre-Boycie years – but it turns out he has previous form for Coronation Street, Z-Cars and some of my favourite 1970s Dr Who episodes, the Seeds of Doom, the series with the rampaging plants. Saturday 20th October – the day of the Tenbury Wells AppleFest, and I’m planning to drive up and help out as needed. But a call last night changes all this. Richard Parry, our ballooning friend, needs a retrieve crew in the morning – and I volunteer, ’cos it’s fun. This means a longer detour via Stonehouse, and into the Severn Vale around Haresfield village – which is in the middle of mistletoe-filled orchards! (You knew mistletoe would feature eventually didn’t you). Richard and crew have by now come over the beacon and are descending into the vale – and I spot them in a distant field at exactly the same time as Richard radios (as usual) that the ‘Eagle has landed’ (yes, I know what you’re thinking, but wouldn’t you say the same in the same circumstances?). 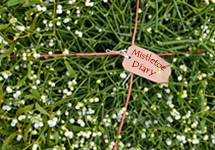 Mistletoe and media are linking well as usual – enquiries from the monthlies have been coming in since August, at both national and local level, with many requesting news about Tenbury Wells, the Mistletoe Festival and the Auctions. Most want pictures from last year and details for this year.